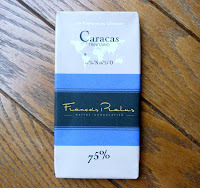 There is a lot to like about the smooth, European-style, chocolate from Francois Pralus (Roanne, France). Unlike some, more rustic (cocoa beans + sugar) single origin dark chocolate bars, today's bar had a buttery mouthfeel - thanks to a bit of added cocoa butter and non-GMO soy lecithin. Other contributing factors to a smoother texture lie in decisions made in the chocolate-making process. Conching chocolate for long periods, yields a smaller ground cacao bean particle size. However, this extra processing may also allow certain volatile flavor compounds to escape, so care must be taken. Today's Caracas 75% bar made with beans from Venezuela, had both smoothness and relatively robust flavor that I associated with Trinitario cacao beans from South America. Today was Day #6 of Chocolate and Venezuela Theme Week.